Check out the Latest Factory Free Agent News at Dale's Blog. Visit the Free Agent On-Line Store. Free Agent wants to sponsor you! 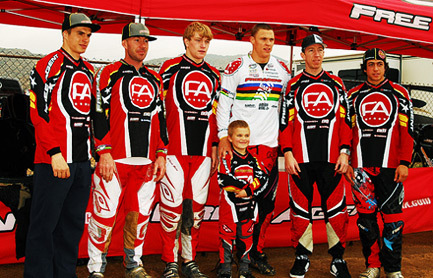 January 1, 2010 (Rancho Dominguez, CA) - Free Agent has announced the line up for the 2010 Factory Free Agent. The team is made up of 14 national and world champions from around the globe. For 2010 Current World Champion and 2008 Bejing Olympic Champion Maris Strombergs will be joined by Cristian Becerine, Fausto Endara, 3-Time World Champion Kyle Bennett and the hottest Neo-Pro on the curcuit Conner Fields. Former World Champion and Free Agent Team Manager Dale Holmes has assembled this elite group and will supervise team activities through out the 2010 season. Click here for the latest Factory Team news. Every member on the team has been hand selected due to their experience and success in the BMX world," stated team manager Dale Homes. The Free Agent World Team will focus on Junior and Elite classes for 2009 with a crop of new signings. THE-Industries, SINZ, ODI, KMC, and Shimano for their support. Please check out their websites for up-to-date information. 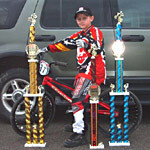 Please check out ababmx.com, nbl.org, vans.com, daleholmes.com, flyingpapayafactory.com,bmxpros.com and bmxmania.com for more info about Factory Free Agent riders and upcoming BMX Racing and Freestyle events.